I realized that I am a ‘junk food vegetarian’, and really haven’t been eating too healthy for the last few years. I am working on changing my diet, which has been a slow process. Do you have any advice on healthy snacks? I tend to snack at work, and would like to stop eating the junk food that is around the office. Great question! As you are changing your diet, the key to transitioning from a ‘junk food vegetarian’ to a more healthy diet will be to incorporate a whole-foods approach to eating, with foods that are nutrient-dense, unprocessed, and organic (when possible). Planning ahead and bringing healthy snacks to the office will help you get into the groove of eating more nutrient-dense foods and avoiding the junk food as much as possible. The more you start to eat snacks made with whole foods, you will likely notice you feel better, have decreased cravings, and have better blood sugar stabilization (and no more sugar crashes!). Generally, to help stabilize your blood sugar and have sustained energy throughout the day, try to remember the rule “NO NAKED CARBS” (like excessive cookies, cakes, and crackers). Here are some of my favorite snacks to try! Handmade nori roll stuffed with greens, avocado, and whatever you would like to put in there! Hope this is a good start – good luck with your transition, and happy snacking! 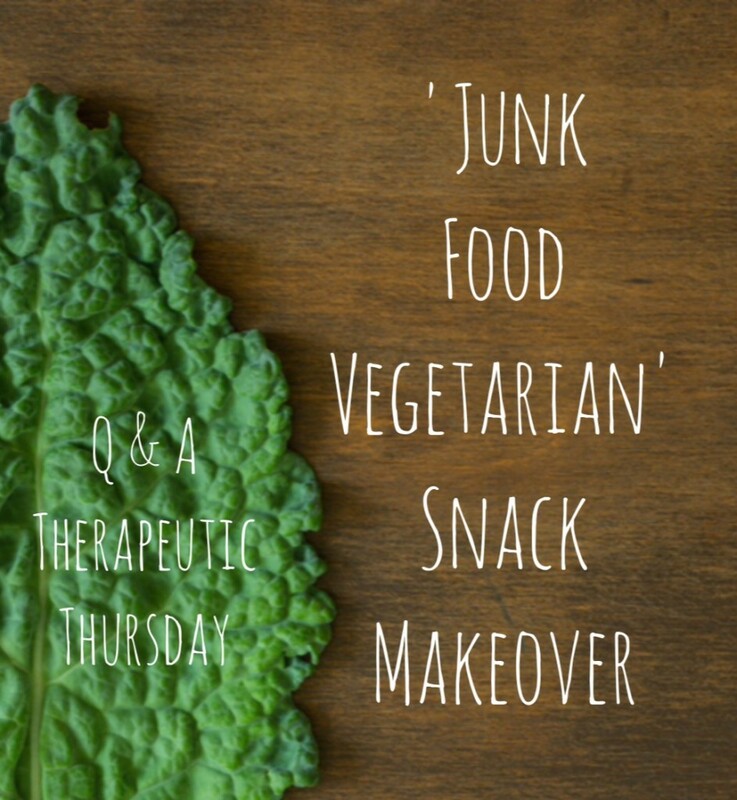 If you have any questions you would like answered on Q & A Therapeutic Thursday (every 1st Thursday of the month) regarding holistic living, self-care, wellness, stress busters, recipes, and recipe adaptations, feel free to email me at: thetherapeuticfoodie@gmail.com. See you next week!